Understanding what it means to marry “the one”. 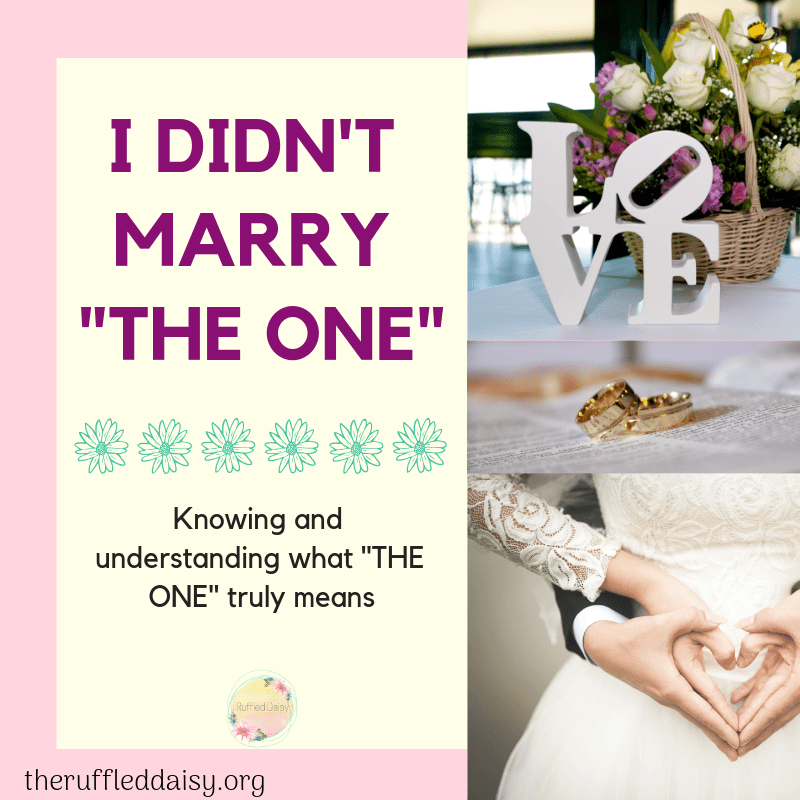 My husband wasn’t “the one” for me! Out of the millions of people on the planet, we don’t have “one” that is destined to be with us. 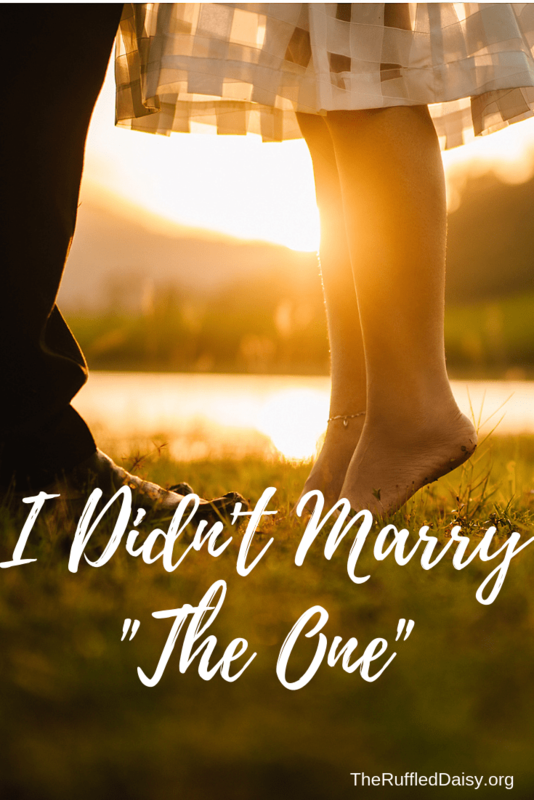 You see, I didn’t marry “the one”. In fact, I chose “the one”. I chose him just as he chose me. We chose, together, to walk this life and write our love story. I chose to love him for better or worse. We’ve had some pretty massive mountain and some pretty low valleys in our marriage, all of which are stories for another day. Unfortunately, now marriage is free from hardships and after close to 16 years of marriage it can take a toll and we can sometimes forget why we chose “the one” we did. Besides, he leaves his socks all over the place. He snores and farts in his sleep! That’s so romantic :/ Whatever happened to the days of when he would pick flowers from the side of the road and bring them home to me? I’ll tell you what happened. Life happened. Life got hard…and busy…and complicated. Bills piled up and kids needed to be disciplined. Forget the fact that the discipline techniques between the two of us are polar opposites. But at the end of the day when my head rests on my soft pillow, I need to remember that I chose this man. And this is the story we are writing in our book of life. Is this the story I want future generations to emulate or one that will be used as an example of what not to do? This man, who is my biggest supporter, can also be my biggest irritation. But you know what? I chose him!! And it’s my duty to honor him. He is my husband, my best friend, my lover, my closest confidant, and most importantly, my biggest cheerleader! He doesn’t complete me or fill me up nor do I expect him to. He does, however, challenge me and encourages me and pushes me to be the best I can be! He is the family that I picked. I chose him and he chose me. And we chose to create this life together no matter how hard it gets. Remember why you chose “the one” for you! Look past the dirty socks and overflowing trash cans and get back to the basics. Did you choose your one or do you think there is ONE out there for you? I’d love for you to share it with your friends on social media and PIN it so you have it for later! If you like what you see on this page, I’d love for you to join my mailing list HERE! When you join, I’ll send you my FREE Home Decor Holiday Printables that you can immediately download. Just my way of saying “thank you” and encouraging you to live your best life!! Love it!!! So true and what a great reminder !